This afternoon I finished the back of Pumpkin. I decided to rip out on Thursday and make the size 3/4. I've opted to to do it in colorblock instead of a solid color since I don't have enough skeins of navy. My intention was to do a Fair Isle or intarsia. 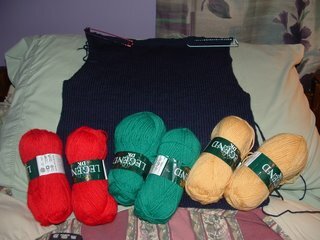 With that in mind, I bought 5 skeins of Sirdar Legend in navy and 2 each in green, red, gold and white. I'm going to do one sleeve in red, the other in gold and the hood will be green. The colors are bold but not overwhelming. Besides, I love seeing kids in colorful clothing. The Bamboo Color socks have officially changed to the Openwork Rib socks. The pattern is from SKS. 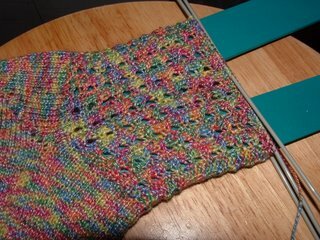 I used the PGR short-row heel and made them a half size larger in the foot than my size. They fit mom perfectly. I was hesitant to finish them while she was in Reno for fear of having the ankle and the leg too small. I steam blocked all the pieces of Rachel. Every once in a while things do go according to plan. I purchased a Jiffy Steamer from an estate sale last year and this was my first time trying it out. 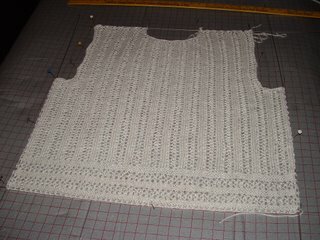 Being a firm believer in the power of wet blocking, I've never given steam blocking a try. The fiber content of Linet requires that you steam block. Even though it was a slow tedious process having to block each piece individually on a card table, I have one thing to say about steaming. Convert me baby! So far I've finished all the seaming and the single crochet trim around the sleeves. I was looking forward to borrowing it from mom. That hope was dispelled when I tried it on. The sleeves are about 2 inches too short and given that me wearing it wasn't part of the original plan it fits her perfectly. At this moment, I'm trying to avoid the sound of Trekking, Shepherd Sock and Bearfoot calling my name. It wafts ever so gently saying ... Knit me Beverly, knit me Beverly. I will be steadfast, until tomorrow. Rachel looks like it's going to be so nice. I had never seen that pattern. Your swallowtail shawl is gorgeous too, I'm sure your neighbor will love it!